LSC is a nonprofit organization dedicated to getting learners of all ages excited about the power, promise, and pure fun of science and technology. Located in Liberty State Park, Jersey City, NJ, we engage learners of all ages in science excitement, provide professional development for teachers, and actively connect people of all backgrounds to pivotal science and society issues. 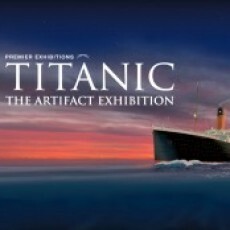 The Exhibition has been designed with a focus on the legendary RMS Titanic's compelling human stories as best told through authentic artifacts recovered from the wreck site of Titanic and extensive room re-creations. Perfume from a maker who was traveling to New York, china etched with the logo of the elite White Star Line, pieces of the Ship itself -- these and many other authentic objects offer haunting, emotional connections to lives abruptly ended or forever altered. Upon entering Titanic: The Artifact Exhibition, visitors will be drawn back in time to April 1912, when the Ship embarked on its maiden voyage. They'll receive replica boarding pass, assume the role a passenger and follow a chronological journey through life on Titanic ' from the Ship's construction to life on board, the famous sinking, and the modern day efforts to recover and conserve the wreckage for future generations.